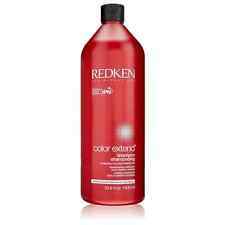 New ListingRedken Color Extend-magnetics Shampoo 33.8 oz. 5 out of 5 stars - Redken Color Extend-magnetics Shampoo 33.8 oz. 2 product ratings2 product ratings - Redken Color Extend-magnetics Shampoo 33.8 oz. Achieve the ultimate color protection and hair softness with Redken Color Extend Magnetics Shampoo with Redken's exclusive RCT Protein Complex. This shampoo treats�the root, core, and tip of the hair. The sulfate free formula gently cleanses color treated hair for four weeks of color vibrancy and radiance. * With Color Extend Magnetic's new smart, multi-targeted delivery system, soy protein adds structure for root lift, arginine maintains health at the core, and sepicap restore ends of damaged hair. Redken Color Extend Conditioner is a great treat for colored hair. Regular use gives complete protection to colored hair with a vibrant and shiny appearance. Redken Color Extend Conditioner gives maximum color protection, so that you don't have to color your hair frequently. Achieve the ultimate color protection and hair softness with Redken Color Extend Magnetics Shampoo with Redken's exclusive RCT Protein Complex. This shampoo treats the root, core, and tip of the hair. For Sale: 1 Redken Color Extend 10.1 oz Shampoo & 1 Redken Color Extend Conditioner 8.5 oz. An award-winning shampoo for color treated hair that maximizes color vibrancy while strengthening hair with daily shampooing. 1x Redken Color Extend Magnetics Sulfate-Free Shampoo 33.8oz (1L). 1x Redken Color Extend Magnetics Conditioner 33.8oz (1L). Color Extend Magnetics Shampoo 1L. Color Extend Magnetics Conditioner 1L. Color Extend Magnetics. Sulfate free Shampoo. 2015 New Beauty Award Best Shampoo for Color Treated Hair. 2014 Ebony Beauty & Grooming MVP Award Best Shampoo for Color Treated Hair. 2014 New Beauty Award Best Shampoo for Color Treated Hair. 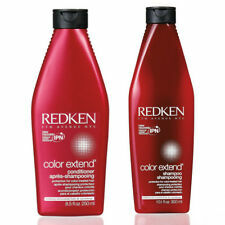 This is a liter set of Redken Color Extend Blondage Color Depositing Shampoo and Conditioner 33.8 oz. The Redken Color Extend Blondage Shampoo is a color-depositing and protecting shampoo for blonde hair. Redken Color Extend Magnetics Shampoo is a sulfate free shampoo that cleanses color treated hair and strengthens the hair fiber from the root to the tip of the hair. Redken Color Extend Magnetics Conditioner is a sulfate free conditioner that provides care for color treated hair leaving a soft and smooth finish. Achieve the ultimate color protection and hair softness with Redken Color Extend Magnetics Shampoo with Redken's exclusive RCT Protein Complex. COLOR EXTEND MAGNETICS. SHAMPOO 10.1 OZ / SOFTENING SHINE. Redken Upgraded Color Extend Magnetics Kit. Color Extend Magnetics Conditioner (1 FL OZ). Color Extend Magnetics Sulfate-Free Shampoo (1.7 FL OZ). REDKEN Color Extend Magnetics Conditioner 33.8 fl oz Brand New, Free Shipping. Detangle, strengthen and protect color-treated hair with the Color Extend Magnetics system. Redken’s exclusive Interlock Protein Network and Charge-Attract Complex deliver charged amino-ions that are attracted to the hair fiber to form a protective barrier. Hair feels fortified and repaired for a reflective-looking finish. WHAT IT ISA color protecting shampoo for color treated hair. Developed with Interlock Protein Network (IPN) technology. Contains a high level of amino-ions to seal in color. Leaves hair soft, smooth and manageable with brilliant color. 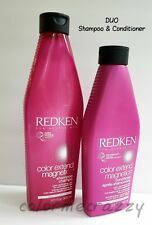 Redken Color Extend Magnetics Shampoo 10.1oz & Conditioner 8.5oz. 1x Redken Color Extend Magnetics Sulfate-Free Shampoo 10.1oz. 1x Redken Color Extend Magnetics Conditioner 8.5oz. Color Extend Magnetics Shampoo 10.1 oz / 300ml. Liter Hair color protecting conditioner provides targeted repair to not only detangle your hair, but also leave it feeling smoother, softer and more conditioned. Redken Color Extend Magnetics Shampoo is a sulfate free shampoo that cleanses color treated hair and strengthens the hair fiber from the root to the tip of the hair. We are very serious against false claims. Trending at $23.60eBay determines this price through a machine learned model of the product's sale prices within the last 90 days. The Redken Color Extend Blondage Conditioner is a color-depositing and protecting conditioner for blonde hair. REDKEN Color Extend Purple Conditioner 33.8oz. Color protecting conditioner for blondes. REDKEN COLOR EXTEND BLONDAGE Shampoo and Conditioner - Purple Color Depositing. Condition is New. Shipped with USPS First Class Package. This is a liter set of Redken Color Extend GRAYDIANT Anti-Yellow Shampoo and Silver Conditioner 33.8 oz. The violet Color Extend Graydiant Shampoo and Conditioner neutralizes unwanted yellow and orange undertones. Redken Color Extend Blondage is a color-depositing and protecting purple shampoo for blonde hair. Color protecting shampoo for blondes. Gently cleanses and adds softness. Key Benefits. VINEGAR RINSE. BRIGHTENING AND SHINE FOR COLOR TREATED HAIR 8oz. COLOR EXTEND. Redken Color Extend Blondage Color Depositing Purple Shampoo 10oz. Condition is New. Shipped with USPS First Class Package. 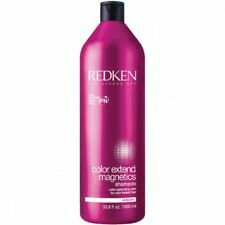 Redken Color Extend Magnetics Shampoo 1L. 1x Redken Color Extend Magnetics Sulfate-Free Shampoo 33.8oz (1L). Color Extend Magnetics Shampoo 1L. Contains Redken’s signature IPN technology. The Redken Color Extend Blondage Shampoo is a color-depositing and protecting shampoo for blonde hair. REDKEN Color Extend Blondage Shampoo & Conditioner 33.8oz. The Redken Color Extend Blondage Conditioner is a color-depositing and protecting conditioner for blonde hair. Trending at $32.91eBay determines this price through a machine learned model of the product's sale prices within the last 90 days. Redken Color Extend BLONDAGE Conditioner 8.5oz - SAME DAY SHIPPING! SALE IS FOR 2 BOTTLES AS SHOWN IN THE AD PIC. Redken Color Extend Vinegar Rinse 1.7oz Travel Size - NEW - SAME DAY SHIPPING! Features Apple Cider Vinegar to gently cleanse and rebalance the hair's pH levels for enhanced smoothness and shine. Instantly brightens and refreshes hair for more radiant haircolor in just one rinse. REDKEN Color Extend Blondage Shampoo 33.8oz. The Redken Color Extend Blondage Shampoo is a color-depositing and protecting shampoo for blonde hair. Color protecting shampoo for blondes. Redken Color Extend BLONDAGE Color Depositing Shampoo 10.1oz - Free Shipping!